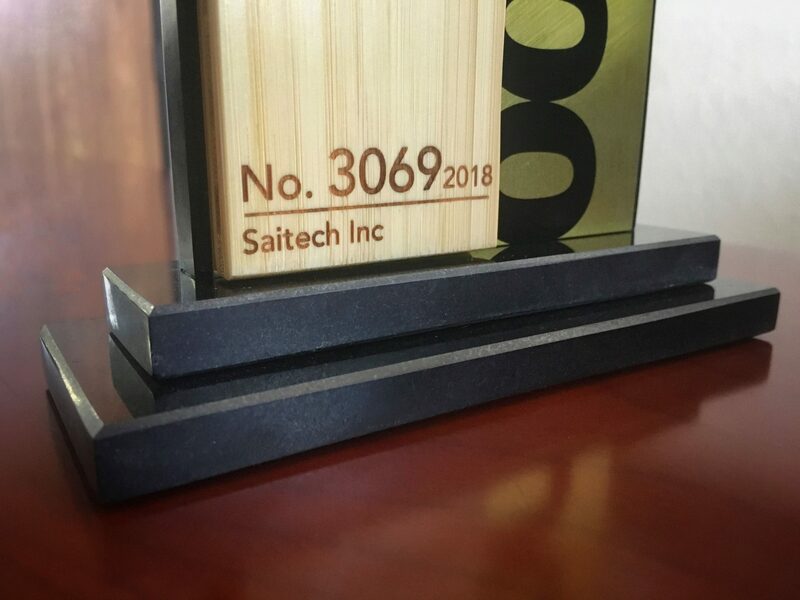 Saitech Inc. is proud to announce that it was included in The Inc. 5000 list of 2018, the fastest growing private companies in the United States. We were also nationally ranked 22nd in our category (Computer Hardware). We would like to express our appreciation to our employees, partners, and customers, as without their contribution this would not have been possible. We’d like to express our gratitude to our partners: Dell, HP, Lenovo, Intel, Xerox, Cisco, VMware, APC, Adobe, Brocade, Western Digital, Seagate, SanDisk, McAfee, Symantec, & Google. Also a big thanks to our top clients in the federal/SLED sector, Defense Logistics Agency, US Navy, Forney ISD Texas, Judicial Council of California, DGS California, Santa Clara Valley Water District, Sacramento Municipal Utility District, and Lawrence Berkeley National Laboratory. Lastly our regards to our associations with MBDA, Western Regional Minority Development Council and US Pan Asian Chamber of Commerce. Saitech Inc has been awarded the 2018 Fast 100 Asian American Business Award by the US Pan Asian American Chamber of Commerce. 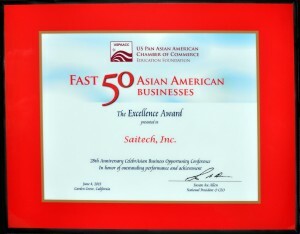 Saitech Inc has been awarded the 2014 Fast 50 Asian American Business Award by the US Pan Asian American Chamber of Commerce. 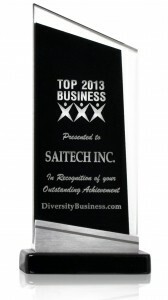 Saitech Inc has been awarded the 2013 Fast 50 Asian American Business Award by the US Pan Asian American Chamber of Commerce. 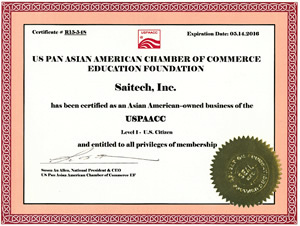 Mr. Vikram Mahajan, President of Saitech Inc. was presented the awarded by Susan Au Allen, National President & CEO of USPAACC at the CelebrAsian 2013 Business Opportunity Conference, the largest Pan Asian American Business Conference on June 4, 2013 at the Hyatt Regency Orange County in Garden Grove, California. 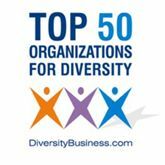 Leaders of Fortune 500 companies, Federal, State, and Local government officials and hundreds of the best and brightest Asian American minority and other small businesses were in attendance. 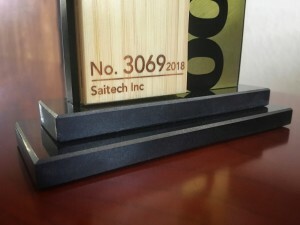 Saitech Inc. was presented the award at the “13th Annual National Business Awards Ceremony and Conference” on April 25, 2013 at the Wynn Resort in Las Vegas, Nevada. 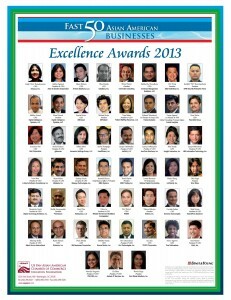 The “Top Businesses” was established in 1999 by DiversityBusiness.com. The program recognizes and honors individuals who have established themselves as a world class community of entrepreneurs that continue to transform the way we live and move our economy forward. The “Top Businesses” are determined by a selection committee which evaluates the eligibility for all submissions in each award category. The “Top Businesses in America” program is sponsored by major brands which include: Apple, AT&T, Wal-Mart, Coca-Cola, Office Depot, Toyota, Cisco, and Verizon, among others. Recipients have been featured in over 1 million Google and media references, secured million of dollars in contracts and have become some of the most distinguished brands.